We transitioned from a Britax Advocate to this Pinnacle and we couldn't be happier. Our daughter loves this seat, and with her growing, it is so much easier for her to get in and out of the seat. A lot of reviews mentioned how hard it is to tighten down... Not at all! Especially when you rethink how and what you're tightening. This seat will tighten down at the shoulder, rather than the chest. This doesn't mean that it's not snug at the chest, it is, but the method that you move the straps is a bit different. So easy though. Plus, triple side impact protected!!! TRIPLE!! I called Britax customer service just to confirm. They were so nice. Also, this seat installs SO EASILY! We 100% recommend this seat. Albee processed my order quickly and the Britax Pinnacle car seat was delivered in a timely manner. The car seat had a recent 2018 manufacture date .The Albee 20% coupon made it even more affordable. With or without the coupon I would have bought it as I was looking for the safest car seat on the market. The seat did take some time to adjust to my grandson and properly install in our SUV. However reading the instructions is very helpful. If you have other Britax ClickTight products this installs in the same manner. It is a heavy car seat as are most Britax car seats and I wouldn't want to move this from car to car on a regular basis. We have had no issues tightening or loosing the straps. My 4 year old grandson loves his new seat. He sits up high and has a better visual on what is happening on the road. The built in cup holder is a plus since it also accommodates his drink and cars too. We are very pleased with this seat and highly recommend it. Very easy to install securely. The only thing I don’t like is that the straps get twisted really easily. I bought this car seat for my grandson because of the safety features which you can read about on line. He loves it due to the comfort factor. I think it’s the best overall product of this type you can buy. It will last him until he reaches 120 lbs., he now weighs about 45 lbs. Since it is made very well it will last until then i’am sure. Worth the extra money. My husband and I bought this about 6 months ago to replace our Britax Boulevard for our now 4 year old, and we absolutely love it! And so does our son! As soon as we had him sit in it, he said "Oooohh!!! My new seat is awesome!" I love that is has as much protection as their other seats but works for a growing 4 year old. The harness combined with the added side protection, reassured me that our son can be comfortable while completely protected in the car! We love this carseat. My daughter is in the 95% for height and we needed a carseat that would keep her in the harness beyond age 3. We got this car seat when she was 2.5years old and already forward facing due to her size and the previous carseat we owned was no longer safe read-facing, so it made sense to find a forward facing seat that would last her until she no longer needed a carseat. We opted for the Pinnacle because it has such high upper limits for size. The ClickTight installs so easily. We brought this seat to visit the inlaws and I loved our easily we could move this carseat from our car to their car and back. The clicktight ensures that it is so secure, but when you need to swap cars, it is really easy to unlock. We've taken this on many roadtrips where we were in the car for hours and hours and my now 3.5 rarely complains about being in her carseat. I am guessing this is due to the comfort. This carseat is REALLY heavy and really wide, we have only one kid in a carseat so we don't have any space issues and rarely have to carry the carseat around. The weight does make me feel better about how strong this seat would hold up in a crash and I am happy with all the extra padding. While we haven't been in a car crash and hope we never do, I feel safer on the roads with her in her Britax carseat. I bought this when my daughter outgrew her advocate 70 CS and we absolutely love it! The clicktight install is amazing and couldn't be any easier. I love the added side impact cushions and the high weight and height limits. I also love how long lasting it is in booster mode. We couldn't be happier with our purchase. 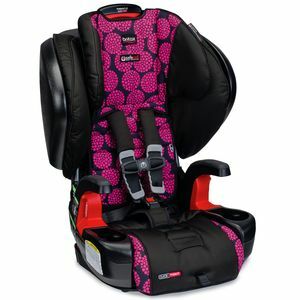 Overall we own 6 Britax car seats and we love them all and recommend them to our family and friends. I bought this 3 months ago. Love it. My son outgrew his convertible car seat and this one is perfect. We can chose either seatbelt or harness. We chose harness because of the clicktight mechanism. Who ever thought of the clicktight is a genius. We have 2 and the car seats don't budge. Love, Love, Love This Seat!!! We've had this seat installed for about a month now and couldn't be happier with it. My son is very comfortable and says it's "awesome!" It was very easy to install and the click tight technology works wonderfully. The seat was snug and secure on the very first try to install. We have complete peace of mind that it is installed correctly and our son is safe while riding in the car. We transitioned to this seat from the Advocate 70 CS and the only thing I miss is the "click" noise that the Advocate has when tightening the straps. I've had no issue with getting these straps tightened at all. My son loves the cup holders and the arm rests too. We like the added side protection that this seat offers and it fits very nicely in our SUV. Overall, we are very satisfied with this seat. Great purchase! We moved up to this from the Britax Boulevard and my toddler loves it! I was worried that it might not fit in my husband's compact car but it fits perfectly. It doesn't seem to take up any more space in the seat than the Boulevard did. It was very easy to install. This is another great Britax product. My daughter is comfortable and happy with her new "big girl" seat. We needed a great car seat for our grandson when he move to Atlanta with his parents. He was ready for a big boy car seat. He loves traveling with Granddaddy and Gramma Jane. We know he is safe and secure. We just learned grandson #2 is on the way so a $100 gift card would help his mom and dad with an additional car seat. Photos are of house we made our grandson with the substancial box. I bought this 1,5 years ago and still look strong and looking good. I picked the green color. I love the Pinnacle, I feel so safe knowing my son is so well protected. The seat is a bit bigger, luckily we only have one child currently so it hasn't been an issue for us. Adjusting the seat has been a breeze and the clicktight has made it a breeze to install. I bought 2 of these car seats for my son who is 4 years old - one for my vehicle and one for my husbands. As a certified car seat technician, I have installed A LOT of car seats and this is by far one of the easiest car seats to install! The click tight is convenient and makes installation a breeze. You don't need to get your knees up and push down on the car seat to make sure it's tight enough. You just put the seat belt through the designated slot - tighten it up a bit - and then push down the seat of the car seat until you hear the "click". It's that simple! And, it's tightly in there! I can't move it more than an inch at the belt path. It's also very easy to take apart and clean. It has an added recline feature when using the 5 point harness that my son likes as well. It's definitely worth spending the money to get this car seat!! I bought this almost a year ago for my step son. I am so impressed with the side impact protection, you can't get any better with that 3 layers of protection. The click tight makes it so easy to transfer from car to car. It's more than what I wanted to spend but you can't put a price on safety! He loves his seat! When he tells you he feels extra safe it makes the cost seem like nothing! The part I loved was the booster can go up to 120lbs!! I love that it has a 9 year lifetime! I know I'll get more than my money's worth with future children! I highly recommend this seat!! Worth every penny!! Love how easy it is to use and the the added safety features! We've had this seat for about 6 weeks now and I love it! It's super easy to get my son in and out of. The straps pull very snug with little effort! My son loves it and seems very comfortable...he even falls asleep in it from time to time. Easily wipes clean. Cup holders are easy for my son to access. Our only complaint would be lack of color options. My son asked for red but only the black, silver, and a pink design are offered in this model. We chose the Pinnacle over the Frontier due to the added safe cell side impact safety feature. This car seat is a little heavy but easy to install so I didn't mind. I'm petite at 5 foot and 90 pounds and had no trouble installing myself. Also this seat is well worth the money! The safety features a Britax provides sold me early on. After buying a different brand infant seat I tried the Britax convertible seat when my son was 10 months old and have loved Britax since. I'll never buy any other brand. I started my daughter in Britax from day one! I booty this car seat about 3 months ago for when I take my niece on car rides. What sold me on it is the triple side impact protection and the clicktight feature. I also love the honeycomb pieces that keep my niece safe if there were to ever be an accident with her in the car. The hug straps are awesome too. I just love that Britax had put safety above all other trivial features such add aesthetics and comfort. I always recommend this booster to everyone I know. We have had this seat for just about 2 years now and it will continue growing with my son. It is easy in and out of the car when needed and the buckles don't get stuck like some of the others I have encountered. This is great for those kids who don't like traveling. They will love it with this model, my daughter does. I have had this car seat for 2 years now. My daughter hated to travel. She would cry and scream the whole time. We trade a few diffrent brand and nothing helped, she was still fussy. We almost gave up and figured we just couldn't go far or very offten. We felt stuck. We had a freind recommend we try Britex so we figured we would give it a try. We didn't exspect much. When we got this car seat it was easy to install and you can see the amazing Quality and the heavy duty frame. We decided to try a small trip and she was so comfortable she didn't scream or cry. We thought that it has to be a fluke, so we tried again. She was still way happier then she ever was before. It was like freedom was given back to us. we love Britex and recommend it to every parent. I could go on for days how amazing this car seat is. They are so superior to other brands. I will never get any other carseat again. We were blown away at how amazing this product is. I bought this carseat after researching online for numerous hours and I was impressed! Love it for our petit 3 year old. Easy to use & I love the quality & Britax customer service. I couldn't wait to get my hands on the new technology of the click tight, and I was relieved at how easy it was. I used to break a sweat trying to get the seats in and out of my husbands car, who's latches are pretty deep within the seat. I also really love the amount of head protection and the usual safety features Britax always has. It has the freedom and "big kid" feel of a booster with the safety of a convertible seat. Love it! 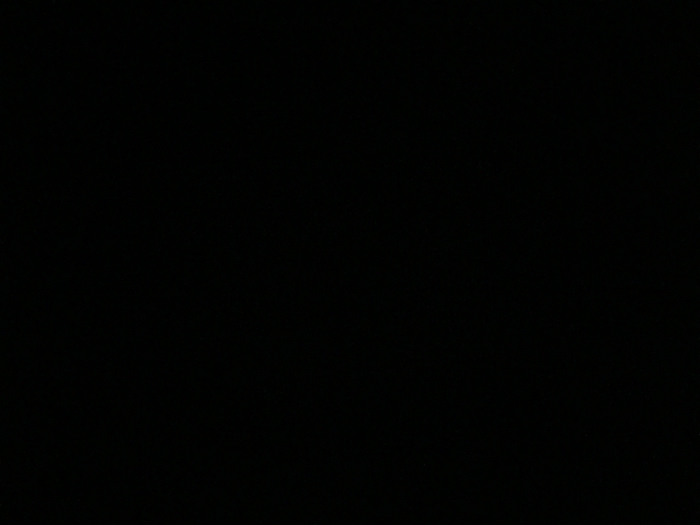 We got the all black version. I've been a Britax customer since my first daughter was born in 2012 and won't use anything else. I know have two daughters and we've had the infant car seat, B Safe, and the convertibles. Now we are moving on up to the pinnacle for my oldest while my youngest gets the convertible. This car seat is so easy to install and I love the safety it provides. Never going to another brand! Ever! This is our second Britax car seat. Our son is nearly 6 now so he needed the larger size of the Pinnacle ClickTight. The new installation design is so much easier than the old design! This care seat makes me feel confident each time we use it. This seat is NOTHING like those cheap things you see at the stores. I would NEVER put my son in one of those flimsy things! I absolutely recommend Britax to everyone I know... and even to strangers! 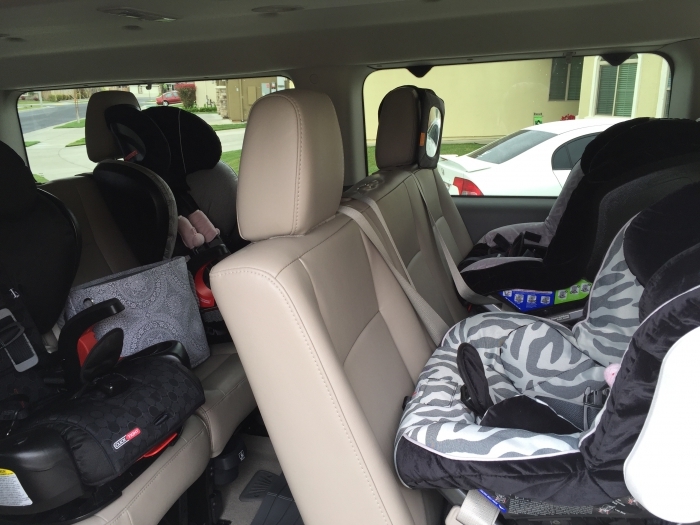 Britax car seats are WORTH EVERY PENNY! I purchased this seat for my 3 year old who outgrew his advocate carseat and I love the this booster has a 5 point harness to keep him in until he's old enough to sit with a seatbelt. Very simple to install and easy to use. Bought this for my three year old. She is bigger then most three year olds and fits perfectly in it. She's comfortable and I know that it's installed correctly by the easy clicktight feature. I love it! Got this car seat in a timely manner. Seems to be well made and very solid. A bit bulky, but that's why we ordered the pinnacle as opposed to the frontier. Definitely recommend. I have just unpacked this outrageously fantastic one of a kind carseat and I am already in love!!! I can tell that this is THE BEST!!! I can already tell this is a great carseat. The appearance,comfort, value, ease of use, and the feel and appearance of the impact protection. I pray that we never have to put this feature to the test, but if it happens, I feel that we have provided THE BEST accident injury protection that money can buy!!! We've bought Britax seats for our kids and just had our first car accident with our Britax. It was a 4 car pile up. Our kids were terrified but not a scratch, bump, or bruise on them! We are now going to purchase our next two Britax tomorrow. I will never own another brand of car seat! This is the third Britax seat I have purchased and have been very happy with the protection the seats have provided both my children. The build quality is very good and the Click Tight system is extremely easy to use and secures the seat to the vehicle very tightly with minimal effort. However, the strap is nearly impossible to fully tighten. My wife constantly has a tough time tightening the belt to the recommended gap of less than 3 inches. I myself, at 62, have a hard time fully tightening the straps. Additionally, while pulling on the tightening strap it always digs into my hands due to the fact that I have to exert so much pressure to get it tightened. This appears to be a regular complaint and I am curious as to whether it is a design flaw? Let me be clear in that I feel my child is 100% safe in the seat but it is just very hard to tighten the straps. 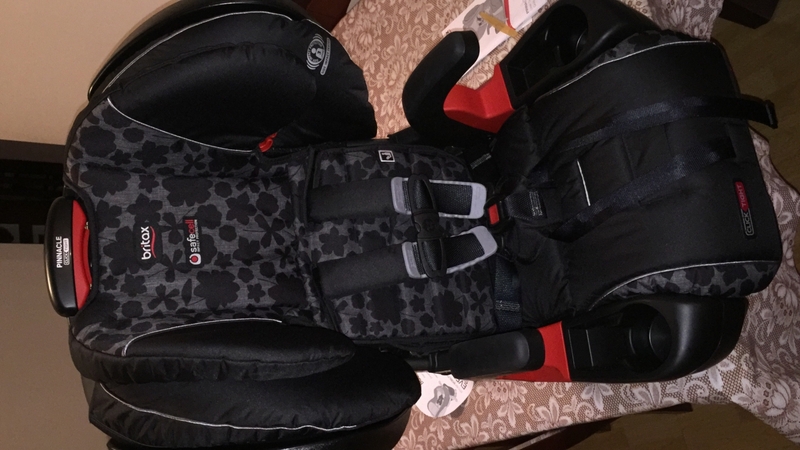 This is the third Britax seat I have purchased and have been very happy with the protection the seats have provided both my children. The build quality is very good and the Click Tight system is extremely easy to use and secures the seat to the vehicle very tightly with minimal effort. However, the strap is nearly impossible to fully tighten. My wife constantly has a tough time tightening the belt to the recommended gap of less than 3 inches. I myself, at 6�¢â�‚¬â�"¢2�¢â�‚¬`, have a hard time fully tightening the straps. Additionally, while pulling on the tightening strap it always digs into my hands due to the fact that I have to exert so much pressure to get it tightened. This appears to be a regular complaint and I am curious as to whether it is a design flaw? Let me be clear in that I feel my child is 100% safe in the seat but it is just very hard to tighten the straps. My child has been in a Britax from the start. After hearing of their great reviews, we went out and got one for each of our car. Installation with the Pinnacle is quick and easy. My child loves it. My only complaint is that the shape of my 2015 Honda Accord back seat puts too much pressure on the strap in the rear which can make it difficult to tighten at times, overall though, I've been extremely pleased with the product and styling. We have 4 of these seats. Both my 3 and 5yr old love the seats and say they are comfortable. They feel like big kids sitting in a booster and I love that they can stay harnessed for a long time. 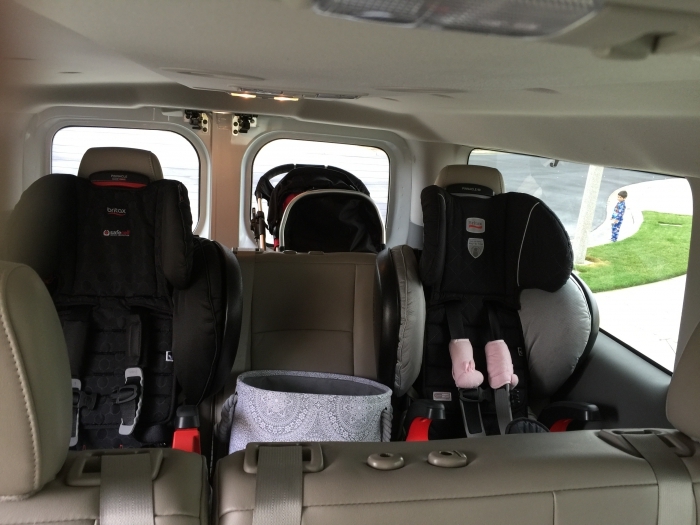 We went from britax convertible seats to these boosters and couldn't be happier. They are very sturdy and well made. Installation is super easy. We are very happy with these seats and have no complaints. This is our second Pinnacle. Really like how solid it's built and how comfortable our kids are in it. It is heavy and bulky and we like it that way. It's pretty easy to install once you familiarize yourself with it. It also has a slight recline for a bit more comfort, our kids heads still flop forward at times when they sleep though. They really don't seem to mind and my oldest actually has figured a way to keep her head back by tucking it in the corner, only her mouth manages to fall wide open, haha, kids are something else. They have never complained about being too hot in the seats. We are very happy with all of our Britax seats! ProsSolidly built. The last car seat our oldest kids will need. Comfy. I have started buying Britax car seats after viewing a video regarding child safety and the importance of having a safe car seat. The best car seat I found was Britax, their quality can't be beat and they not only make excellent car seats, they make pretty car seats. I hate baby products that are weird looking and come in ugly funky colors. 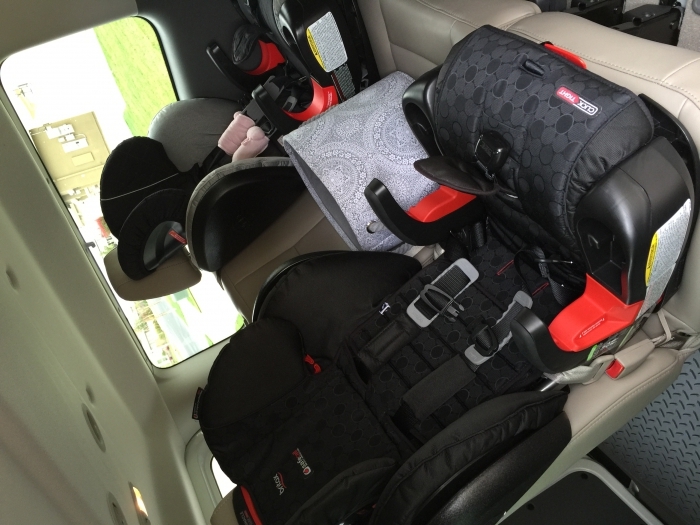 Britax car seats do cost more but they are worth every penny, I am sold on Britax, no other product will do! Also, I always get compliments regarding how pretty these car seats are. What makes thing even better I that Albee Baby prices for Britax car seats are better than Target. Albee Baby has become my only place to shop for quality baby products, their prices can't be beat! My son recently outgrew his (other brand) car seat in the 5-point harness setting, and needed to be switched to the booster mode. 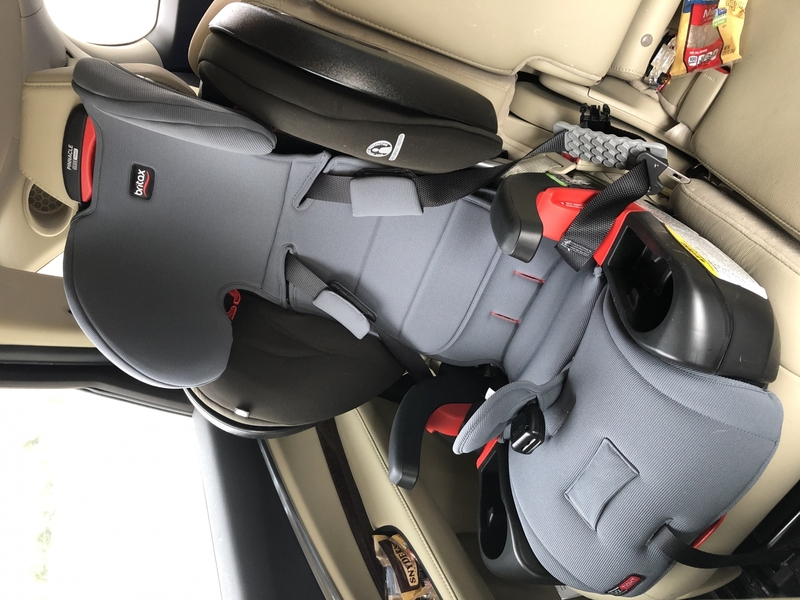 I didn't feel comfortable switching him out of the 5-point harness setting yet, so I searched for an alternate car seat that would work for us and came across the Britax Pinnacle ClickTight. I am in love with this seat and so is my son! It is so protective, safe, sturdy, and visually-appealing. I really like that "Circa" fabric style matches my baby's B-Safe 35 "Circa" fabric too! The seats look so sharp sitting next to each other in my vehicle. 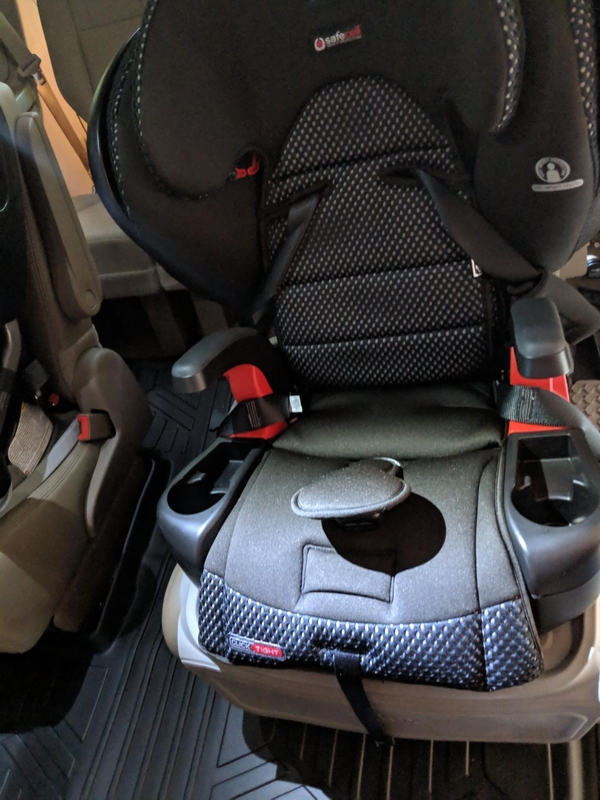 The seat is very easy to adjust/use, and my son can actually buckle and unbuckle himself (he couldn't with his other car seat) which helps me out. The only negatives I have regarding the Pinnacle are that it is HEAVY and the top-half is bulky. I have purchased Britax car seats previouslyand I am vey happy with Britax quality. I have now purchased two more Britax Pinnacle model for my grandkids and they, as always exceed my expectations regarding quality, safety and beauty. Britax products are worth every penny, because the safety of my grandchildren is priceless to me. I am a lifetime fan of Britax and I will only buy them from Albee Baby, the prices are lower than any discount store. I highly recommend Britax car seats to everyone, friend or not. Love the installation but very hard to tighten the belt! I love how easy it is to install this seat but I'm very upset by how difficult it is for both me and my husband to tighten the straps. We've owned both Boulevard and Advocate with the Click and Safe harness indicator. I may need to return this seat and buy one with the harness indicator. I'm not sure why Britax didn't include that on this seat. I would think it should be on every seat. The Boulevard and Advocate were much easier to tighten. I think this might be a design flaw in the seat based on other similar reviews I've seen. Got this seat a month ago and finally went on a family road trip. My 4 year old daughter loves the seat and said it was very comfortable. Vehicle install was quick and easy with clicktight. Extremely satisfied with Britax since this is my second seat. Did a lot of research in the past looking at its safety, design features and reputation...Britax it was. Many thanks from Japan. Order was processed efficiently and we received the car seat within a few days. Great service! My bf says it's not to weighty considering how sturdy it seems and that adjusting straps is easier then on our previous britax model. My four year old says it is comfortable and has learned how to buckle her own straps, enjoys her little drink holders. Shipment was on time. Nice deal on top on the line Britax. Well built. Very ergonomical and well designed. Well worth the price due to not only the high quality but also the length of time the seat can be used. With the abilty to cover such a wide range of size and weight it actually saves you the cost of of car seat . The absolute best feature is the click tight feature. It is very easy to use and fool proof. It does a great job of quickly and consistantly installing the seat with the proper belt tension everytime. I highly recommend this car seat. This seat is great. Easy to install and doesn't move. It's the tightest car seat I've ever installed. My daughter loves the cup holders. She's very happy with her new big girl seat! My son LOVES this seat! I bought this seat back in March (2015), and it is a great seat! It is so easy to install, my son loves the comfort, and I love how secure it feels. I feel confident that I made a great purchase! SAFEST CAR SEAT OUT THERE! We love Britax! We have one of these and one of the Frontier models and we love them both! Easy to install, comfortable for my daughter (who is on the tall side) and offer the best impact protection out there. We have 4 of them! This seat is awesome, so much so we have 4 of them! We have had no trouble tightening the straps as others describe. In fact, they adjust very easily with both of our kids. Our kids love the seats and we find them very functional. The click tight technology has made the installation much better and moving between cars much smoother. I bought this carseat as an extra carseat for the grandparents and anyone else who will be toting around my 2 year old son. I've read how a lot of times carseats are not install properly and in general it's just a pain to install. Low and behold, did my research and thought the click tight technology would answer my prayers. I chose the carseat + booster instead of the regular carseat model because It thought I would get more uses out of it once my 2 year old grows out of the general carseat. It was super easy to install and super easy to teach my inlaws. I'm overall happy with the product, although I wish it was more stylish. 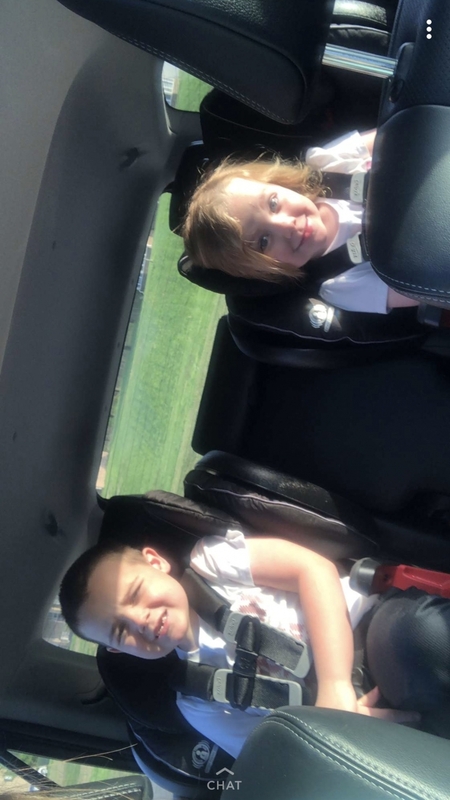 I love my maxi cosi pria 85 and 70 and compared to them this carseat is less comfortable and stylish but can't beat knowing that the carseat is installed correctly! Really easy to install, especially for me as a single mom but it's pretty heavy. Don't get if planning moving between cars. Great if putting it in and leaving it. I feel my son will be very protected with this seat. Got this bc I wasn't ready to get my tiny toddler out of her britax convertible car seat but she's 4- and wanted to be in a big girl seat. This is the compromise. I'm so glad Britax offers the harness belt. As a parent it provides me with confidence knowing that she's safely tucked in her seat. Putting the seat in is easy as pie. However the anchor attachment belt is little short and made it difficult to attach that way. The base is heavy which is great knowing that the seat will not move around but a little inconvienent to those who need to constantly switch it in/out cars. I just brought 2 seats :). The cup holders are perfect- it has 2/easy access and fits most water bottles and toys. The only thing I wished this seat had like the convertible car seat is the click tight function for the harness straps. I love that this seat will last through the other booster seat stages. This is a one stop booster seat. I definitely recommend this seat. Yes it's pricey compared to others but offers the most safety for your most precious cargo. Albee offers the best price w no tax and free shipping. Definitely worth your peace of mind. ProsSafety/ extra padding around head area. Heavy base. Harness belt. Convenient access to removing seat cover for cleaning. 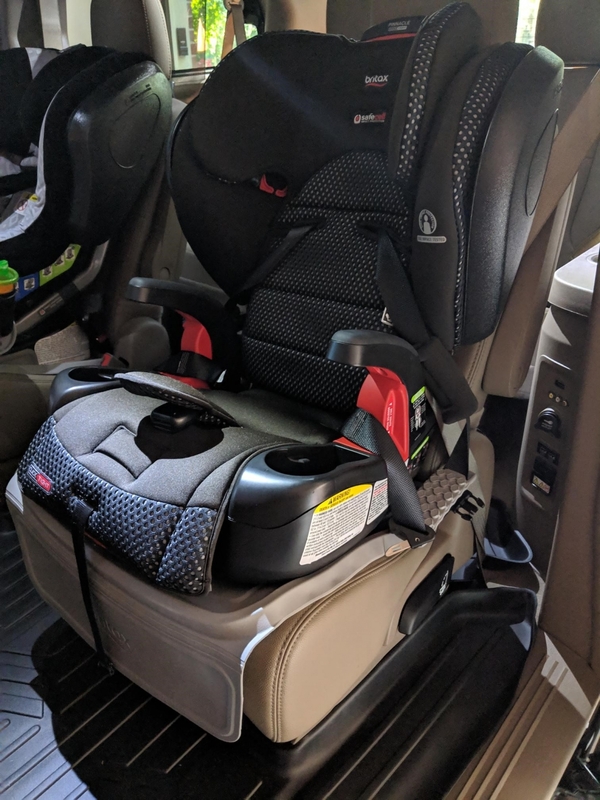 I am extremely pleased with Britax Pinnacle Clicktight not only was it easy to adjust to fit my daughter and to install, but She absolutely loves it and is excited to ride in it. Thank you Albee Baby for such an easy ordering process and quick delivery.